The Doctor: Well I’m the Doctor and you can’t have it! The Doctor and Romana are called to Cambridge, 1979 by an old friend of The Doctor’s, Professor Chronotis. It seems that he “accidentally” brought a book back with him from Gallifrey. But not just any book. It is one of the artefacts created by Rassilon in the old days when the universe was young. 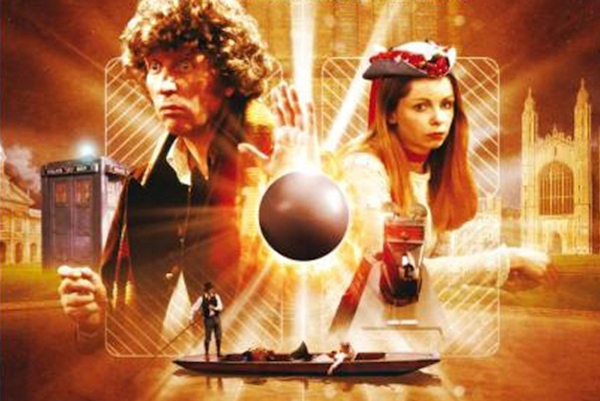 The Doctor, Romana and K9 must find the book before Skagra, a power crazed scientist, finds it. The book has a special power. It can lead the person who possesses it to Shada, an ancient prison planet of The Time Lords. Shada is famous in Doctor Who circles for more than one reason. Firstly, it was written by one of the greatest writers to work on the series, Douglas Adams. Also, it starred The Fourth Doctor whose incarnation was considered, by many, to be the best but it is mostly famous because Shada was never finished due to industrial action. Instead of waiting until the strike was over, the BBC simply shelved the story. The first three episodes do not feel the loss very much, they are pretty much complete. It’s the later episodes that really feel the loss of material. Shada has been “remade” a few times now. Big Finish did a version with Paul McGann playing the role of The Doctor. Gareth Roberts recently did a highly acclaimed novelisation. In 1992, Tom Baker provided linked narration for the parts of the story that were not made; this was released on VHS with a copy of Douglas Adam’s final version of the script. The writing on Adam’s part is excellent. He provides a fun and intelligent story which ranges from the beautifully filmed bike chase to the scenes with the Porter Wilkins. Adams himself went to Cambridge, so some parts of the story are truly authentic. Baker’s portrayal of The Doctor is excellent. His portrayal as The Doctor is at its height, he is both mad and majestic. The problem with this story unfortunately, is that most of the guest actors’ material was not filmed, so we can’t really judge the performers with only half or so of the material available. I have to make an exception though; Daniel Hill is excellent as Chris Parsons. He is the Arthur Dent of the piece, mystified by space but willing to try and help to save the day. It is an excellent performance even if marred by the fact that a lot of his scenes don’t exist. In summing up, Shada is one of the best stories that we never got to see, of all time. It has a brilliant script brought to life very well by the cast particularly by Tom Baker who seems to love the script even more than the viewer. I feel that Shada is probably the greatest loss of the industrial action. Not just because it was an episode of Doctor Who but also because it was Douglas Adams’s last ever Doctor Who story. Now that is really sad. ← Asylum of The Daleks?